It seems that juicing is all over the place today. But the thing is, if you buy a store bought juice (especially if it’s made elsewhere – i.e. not fresh on the property) chances are you are doing yourself a big disservice. Those kind of juices are laden with sugars (even if natural! ), pasteurised and often full of other nasty’s. Even the fresh juice (in my opinion) often have an over reliance on fruit to sweeten the taste. As you get more into juicing and know you’ll do it regularly you can upgrade to something better. There are centrifugal ones (cheaper, but the juice isn’t quite as good, but really they are fine. I had one for 4.5 years and still do in fact, I just upgraded to the next type) and cold press juicers. Cold press tend to be quieter, their juice lasts longer (most juice you should aim to drink within 15 minutes of making it. If storing, store in air tight glass jar and fill to the brim so no oxygen gets in. Even then the centrifugal machine’s juice doesn’t taste great after half a day. The cold press ones are supposed to make the juice last 24 – 48 hrs although I have my suspicions about that. Certainly the taste is best drunk fresh). Cold press ones are also more expensive, but they give you more yield (juice) for the same veg amount. Not a huge amount, but some. They also tend not to separate out so much either. Although this depends on what you juice. So why juice at all? It’s the quickest way I know to get super nutrition into your body. The the vitamins from all the amazing veggies, straight into your system. Because you strip the fibre out, the juice gets absorbs straight away into your blood within a few (15 or so ) minutes. You have no heavy bloating of trying to eat all those veggies (and most of the nutrients are trapped into the fibres anyway). Pro’s: Lighter on the stomach, energy hit straight away, can drink more litre for litre as lighter than smoothie, get more vitamins and minerals in as using more veg. Con’s: Washing up longer, leftover pulp (although other than compost, there are creative ways to incorporate into other things), more expensive on produce as requires more litre for litre. I recommend just picking one to get started with. I started with a juicer I believe. But soon did both. You can decide for yourself if you want to do one, the other or both. Personally I recommend both eventually. But start with just one practise if you are doing neither. Give it a few months and then incorporate the other too. In terms of what I put in my juice. As a rule of thumb, I usually always want lemon in there. Then it’s usually ginger, cucumber, courgette, celery. That’s usually the base. Then I add salad leaves, kale, spinach, bell peppers, tomatoes and some other veg I might have. It’s 100% vegetable juice (expect that obviously tomatoes are fruits and so are some other ‘veggies’. But you know what I mean. What we think of as veg). I think I used to put a little pear or apple in there in the beginning, but slowly transitioned off. If you’re new to juicing, then I recommend starting at 50% veg and 50% fruit. Gradually reduce over 3 – 6 months to 80/20 in favour of veg, then eventually 90/10 or 100% veg too. I really recommend lemon or lime in almost every veg juice as otherwise it will taste pretty earthy. Maybe with fruit in there it’s not as important, but lemon is great for you anyway, so why not include. 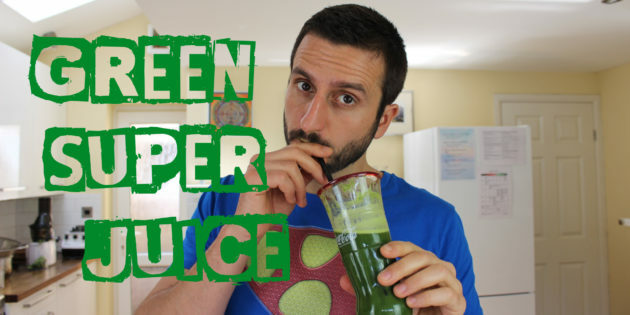 Check out the video below for me making the juice, together with the list of ingredients and their benefits.